Ootaki C, Hayashi H, Taniguchi H, Yamashita K, Tsuzuku M, Amano M. The Benefit of Echo-Guided Axillary Approach to Brachial Plexus Block. Jap J Clin Anesth 1999;19:207-12. Hayashi H, Ootaki C, Tsuzuku M, Amano M. Respiratory Jugular Venodilation: Its Anatomic Rationale as a Landmark for Right Internal Jugular Vein Puncture as Determined by Ultrasonography. J Cardiothorac Vasc Anesth 2000;14:425-7. Hayashi H, Ootaki C, Tsuzuku M, Amano M. A New Landmark for Right Interernal Jugular Vein Puncture in Ventilated Patients. J Cardiothorac Vasc Anesth 2000;14:40-4. Ootaki C, Amano M. Echo-Guided Brachial Plexus Block; Axillary and Infraclavicular Approach. J Jap Soc Surg Hand 2000;16:728-32. Ootaki C, Hayashi H, Amano M Ultrasound-Guided Infraclavicular Brachial Plexus Block; An Alternative Technique to Anatomical Landmark-Guided Approaches. Reg Anesth Pain Med 2000;25:600-4. Ootaki C. Use of ultrasound to control depth of needle insertion. Reg Anesth Pain Med 2001;26:384-5. Fukamachi K, Ootaki Y, Horvath DJ, Massiello AL, Kamohara K, Akiyama M, Cingoz F, Ootaki C, Kopcak MW, Dessoffy R, Liu J, Chen JF, Zhou Q, Benefit S, Golding LA, Alfini S, Rowe DT. Progress in the development of the DexAide right ventricular assist device. ASAIO J 2006;52:630-3. Kamohara K, Banbury M, Calabro A, Jr., Popović ZB, Darr A, Ootaki Y, Akiyama M, Cingoz F, Ootaki C, Kopcak MW, Jr., Dessoffy R, Liu J, Fukamachi K. A novel technique for functional mitral regurgitation therapy: Mitral annular remodeling. Heart Surg Forum 2006;9:E888-92. Kamohara K, Popovic ZB, Daimon M, Martin M, Ootaki Y, Akiyama M, Zahr F, Cingoz F, Ootaki C, Kopcak MW, Jr, Dessoffy R, Liu J, Thomas JD, Gillinov AM, Fukamachi K. Impact of left atrial appendage exclusion on left atrial function. J Thorac Cardiovasc Surg 2007;133:174-81. Cingoz F, Fukamachi K, Ootaki Y, Kamohara K, Akiyama M, Ootaki C, Kopcak MW, Liu J, Noecker A, Dudzinski D, Smith WA, Duncan B. Cleveland Clinic PediPump lamb cadaver fitting studies. Artif Organs 200731:405-8. Ootaki Y, Ootaki C, Kamohara K, Akiyama M, Cingoz F, Kopcak MW, Jr., Dessoffy R, Liu J, Massiello A, Horvath D, Chen JF, Zhou Q, Benefit S, Golding LAR, Fukamachi K. Cadaver fitting study of the DexAide right ventricular assist device. Artif Organs 2007;3:646-58. Kamohara K, Weber S, Klatte RS, Luangphakdy V, Flick CR, Ootaki Y, Akiyama M, Cingoz F, Ootaki C, Kopcak MW, Jr., Liu J, Chen Ji-F, Navia JL, Smith WA, Fukamachi K. Hemodynamic and metabolic changes during exercise in calves with total artificial hearts of different sizes yet similar output. Artif Organs 2007;31:667-76. Saeed D, Weber S, Ootaki Y, Mielke N, Ootaki C, Akiyama M, Horai T, Catanese J, Fumoto H, Dessoffy R, Dudzinski DT, Gu L, Casas F, Smith WA, Fukamachi K, Duncan BW. Initial acute in vivo performance of the Cleveland Clinic PediPump left ventricular assist device. ASAIO J 2007;53:766-70. Fukamachi K, Ootaki Y, Ootaki C, Akiyama M, Kamohara K, Cingoz F, Horvath DJ, Chen JF, Massiello AL, Dessoffy R. Innovative, replaceable valve: Concept, in vitro study, and acute in vivo study. Artif Organs 2008;32:226-9. Ootaki Y, Saeed D, Ootaki C, Akiyama M, Fumoto H, Horai T, Dessoffy R, Catanese J, Massiello A, Horvath D, Chen JF, Benefit S, Golding LAR, Fukamachi K. Development of the DexAide right ventricular assist device inflow cannula. ASAIO J 2008;54:31-6. Saeed D, Ootaki Y, Ootaki C, Akiyama M, Horai T, Catanese J, Fumoto H, Dessoffy R, Massiello AL, Horvath DJ, Zhou Q, Chen JF, Benefit S, Golding LAR, Fukamachi K. Acute in vivo evaluation of an implantable continuous flow biventricular assist system. ASAIO J 2008;54:20-4. Mihaljevic T, Ootaki Y, Robertson JO, Durrani AK, Kamohara K, Akiyama M, Cingoz F, Ootaki C, Dessoffy R, Kopcak M, Liu J, Fukamachi K. Beating heart cardioscopy: a platform for real-time, intracardiac imaging. Ann Thorac Surg 2008;85:1061-5. Akiyama M, Popovic ZB, Kamohara K, Cingoz F, Daimon M, Ootaki C, Ootaki Y, Martin M, Liu J, Kopcak MW, Jr., Dessoffy R, Fukamachi K. Acute reduction of functional mitral regurgitation in canine model using an epicardial device. Ann Thorac Surg 2008;85:1771-5. Manzo A, Ootaki Y, Ootaki C, Kamohara K, Fukamachi K. Comparative study of heart rate variability between healthy human subjects and healthy dogs, rabbits, and calves. Lab Anim 2009;43:41-5. Ootaki C, Yamashita M, Ootaki Y, Kamohara K, Weber S, Klatte RS, Smith WA, Massiello AL, Emancipator SN, Golding LAR, Fukamachi K. Reduced pulsatility induces periarteritis in kidney and the role of the local renin-angiotensin system. J Thorac Cardiovasc Surg 2008;136:150-8. Ootaki Y, Ootaki C, Kamohara K, Akiyama M, Zahr F, Kopcak MW, Dessoffy R, Fukamachi K. Phasic coronary blood flow patterns in dogs vs. pigs: An acute ischemic heart study. Medical Science Monitor 2008;14:BR193-7. Fumoto H, Gillinov AM, Ootaki Y, Akiyama M, Saeed D, Horai T, Ootaki C, Vince DG, Popović ZB, Dessoffy R, Massiello A, Catanese J, Fukamachi K. A novel device for left atrial appendage exclusion: The third-generation atrial exclusion device. J Thorac Cardiovasc Surg 2008;136:1019-27. Ootaki Y, Ootaki C, Massiello A, Horvath D, Chen J-F, Mihaljevic T, Navia JL, Smedira NG, Golding LAR, Fukamachi K. Human clinical fitting study of the DexAide right ventricular assist device. Artif Organs 2009;33:558-61. Ootaki C, Manzo A, Kamohara K, Popović Z, Fukamachi K, Ootaki Y. Heart rate variability in progressive heart failure model by rapid ventricular pacing. Heart Surg Forum 2008;11:E295-9. Ootaki C, Barsoum S. Obstetric anesthesia training in the USA, experience of the Cleveland Clinic; Cleveland, Ohio. Masui 2009;58:1179-86. Horai T, Fumoto H, Saeed D, Zahr R, Anzai T, Arakawa Y, Shalli S, Ootaki C, Catanese J, Akiyama M, Tan CD, Rodriguez ER, Young JB, Fukamachi K. Novel implantable device to detect cardiac allograft rejection. Circulation. 2009;120:S185-90. Ootaki C, Barsoum S. A day in the busy obstetric unit from the anesthesiologist point of view, an experience from the Cleveland Clinic; Cleveland, Ohio. asui. 2009 Oct;58(10):1328-35. Ootaki C, Stevens T, Vargo J, You J, Shiba A, Foss J, Borkowski R, Maurer. Does general anesthesia increase the diagnostic yield of endoscopic ultrasound-guided fine needle aspiration of pancreatic masses? Ootaki C, Yamashita M, Ootaki Y, Saeed D, Horai T, Fumoto H, Massiello AL, Emancipator SN, Golding LA, Fukamachi K. Periarteritis in lung from a continuous-flow right ventricular assist device: role of the local Renin-Angiotensin system. Ann Thorac Surg. 2013 Jul;96(1):148-54. "Venodilation During Mechanical Ventilation-New Approach to The Right Jugular Vein Cannulation." Presented at 44th Japan Society of Anesthesiologists Annual Meeting 1996. "The Benefit of Echo-Guided Axillary Approach to Brachial Plexus Block." 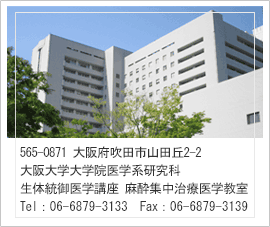 Presented at 17th Japan Society of Clinical Anesthesia Annual Meeting 1997. "The Technique of Brachial Plexus Blockade Under Ultrasound-Guide Axillary Approach." Presented at 45th Japan Society of Anesthesiologists Annual Meeting 1997. "The Study of Appropriate Volume and Concentration of Lidocaine for The Brachial Plexus Block Under Ultrasound-Guide Axillary Approach." Presented at 45th Japan Society of Anesthesiologists Annual Meeting 1997. "The Brachial Plexus Block Update." Presented at 18th Japan Society of Clinical Anesthesia Annual Meeting 1998 as Invited Speaker. "Echo Guided Infraclavicular Brachial Plexus Block." Presented at 73rd International Anesthesia Research Society Annual Meeting 1999 in Los Angeles, CA. "Echo-Guided Brachial Plexus Block; Axillary and Infraclavicular Approach." Presented at 45th Japan Society for Surgery of the Hand Annual Meeting 2000. "Histological Analysis of Renal Arteries after Chronic Mechanical Support with Pulsatile or Reduced Pulsatile Perfusion". Presented at 52nd American Society for Artificial Internal Organs Annual Meeting 2006 in Chicago, IL. "Spinal analgesia and desmopressin treatment in a parturient with von Willebrand's disease type 2 M." Presented at American Society for Obstetric Anesthesia and Perinatology 40th Annual Meeting 2008 in Chicago, IL. "A Case of General Anesthesia with Epidural Anesthesia for Diagnostic Laparoscopy and Cesarean Section at Twenty-Seven weeks’ gastaion." Presented at American Society for Obstetric Anesthesia and Perinatology 40th Annual Meeting 2008 in Chicago, IL. "Reduced Pulmonary Arterial Pulsatility Induced Periarteritis in the Intra-Pulmonary Arteries And the Local Rennin-angiotensin System" Presented at the AHA Scientific Sessions 2009 in Orland, FL. "The Muscle Relaxtant for OB Anesthesia ." Presented at 57th Japan Society of Anesthesiologists 2010 as Invited Speaker. "Does." Presented at 93rd International Anesthesia Research Society Annual Meeting 2011 in boston, MA.